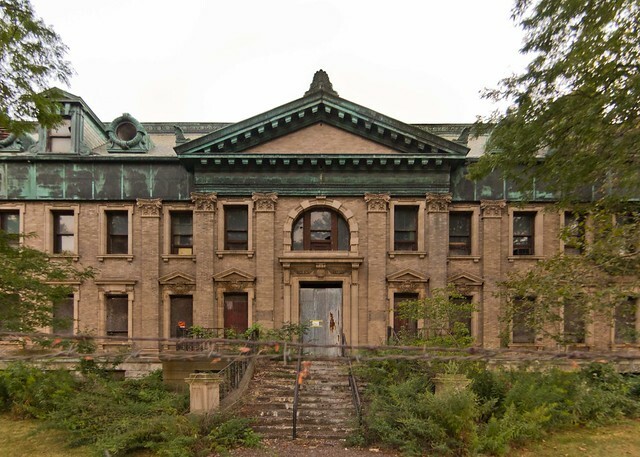 Erie County Supreme Court Judge Kenneth Case has granted a 90 day stay in the case involving the the future of the Bethlehem Steel Administration building, the best example of any administration building for an extant industrial complex in Western New York. This photo is from Steel Plant Museum. 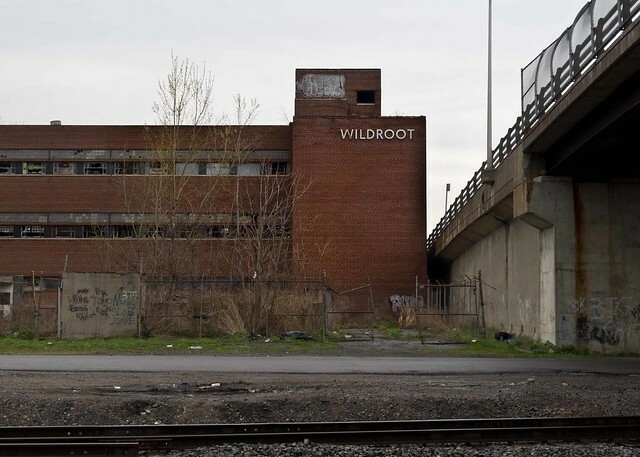 During this period Gateway Corporation will fully explore the possible reuse of this heritage building. 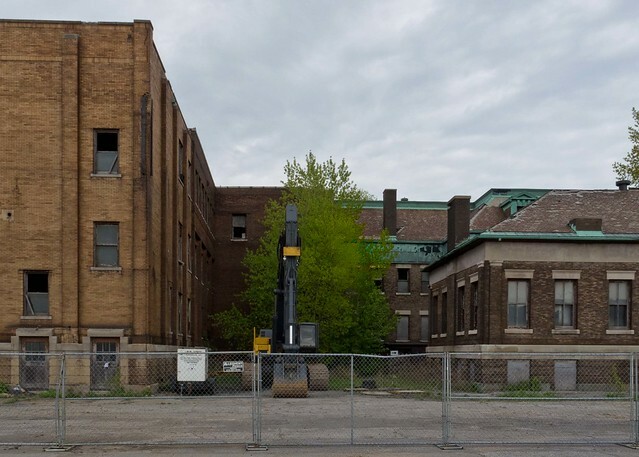 fixBuffalo learned today that the completion of the National Register application that local preservationist Darren Cotten is currently writing will play a role in the building's future. 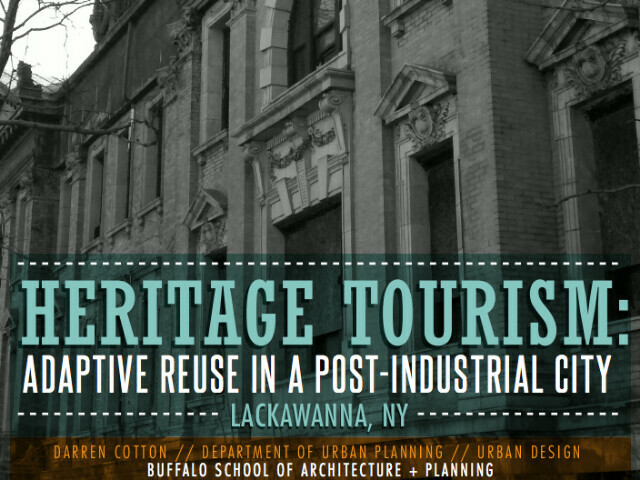 Darren is a founding member of the Lackawanna Industrial Heritage Group (LIHG). 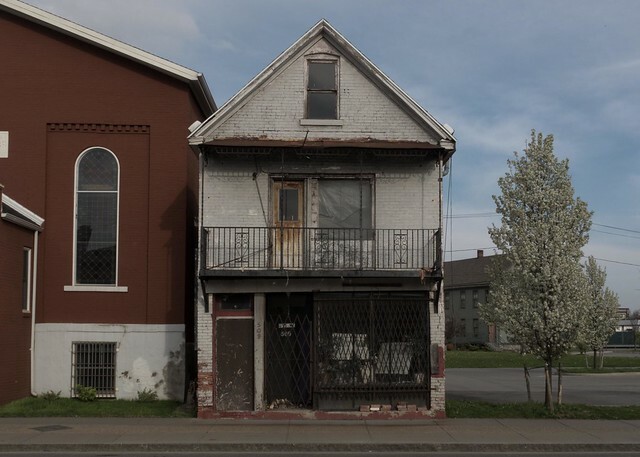 This newly formed preservation advocacy group recently convened a number of meetings with local attorney William Magavern, Jason Yots - preservation consultant and Lackawanna's Common Council President Henry Pirowski and the building's owner. 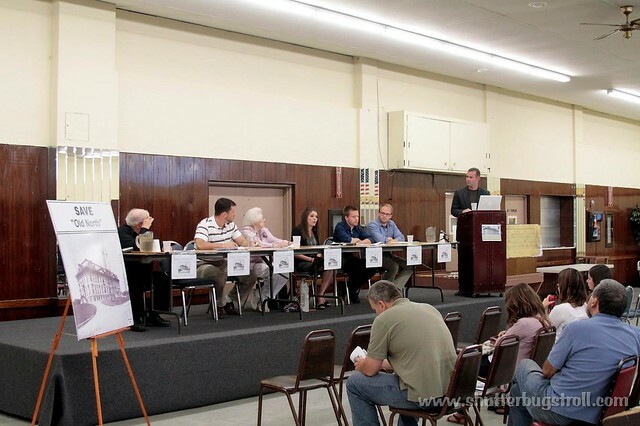 During a recent meeting Jason Yots presented a compelling case involving the use of tax credit financing for a heritage reuse proposal. 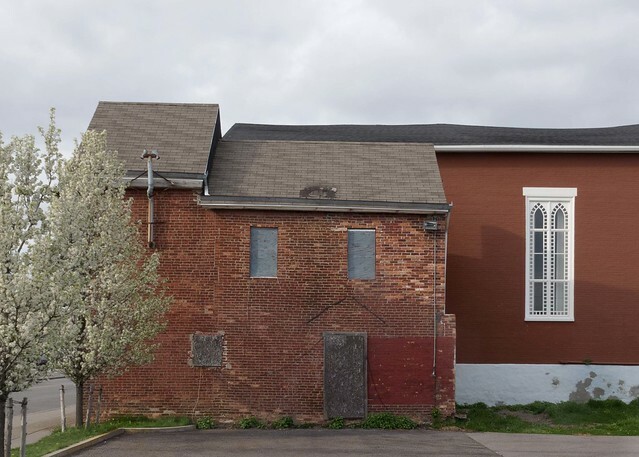 This proposal, along with the State Historic Preservation Office (SHPO) recent decision to require a second survey of the building, has helped shape this new dialog around the building's future. I discussed the outcome of yesterday's court decision with a number of LIHG's founding members today. 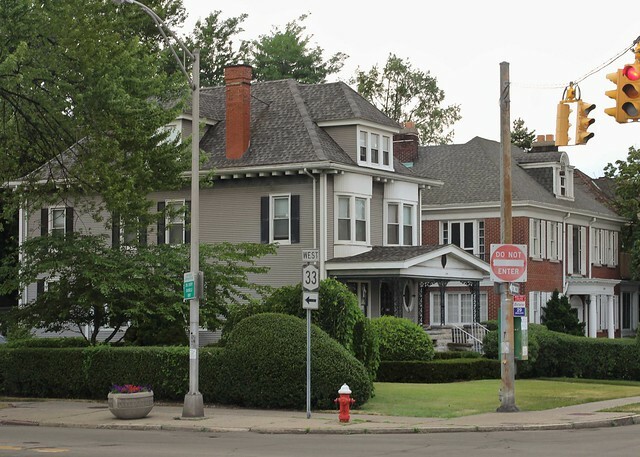 They were excited to know that the Court, City of Lackawanna and the building's owners are now on board with some of the best urban planning and preservation practices in the region. In Buffalo we've learned that heritage building restoration often begins with bright shinning lights. The lighting of the Richardson Complex comes to mind. 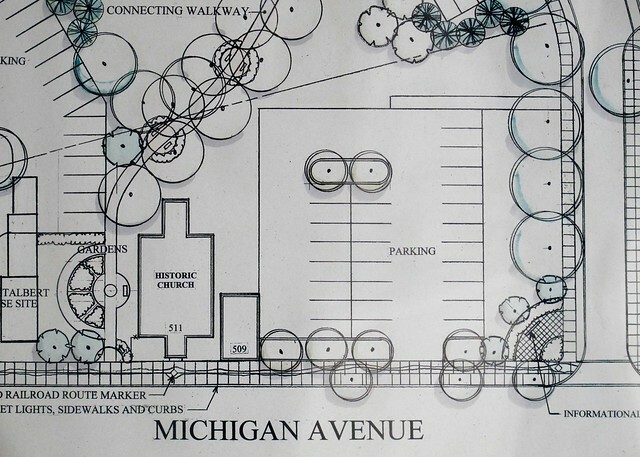 Imagine for a moment - removing the overgrown trees in front of the building and installing a few spotlights. The Bethlehem Steel Administration Building is an amazing building by day. It will be brilliant by night. For additional images of one of the region's most amazing cathedrals of industry see these pics and especially this Facebook Group - Bethlehem Steel North Office Photography & Preservation - for some amazing interior photographs. 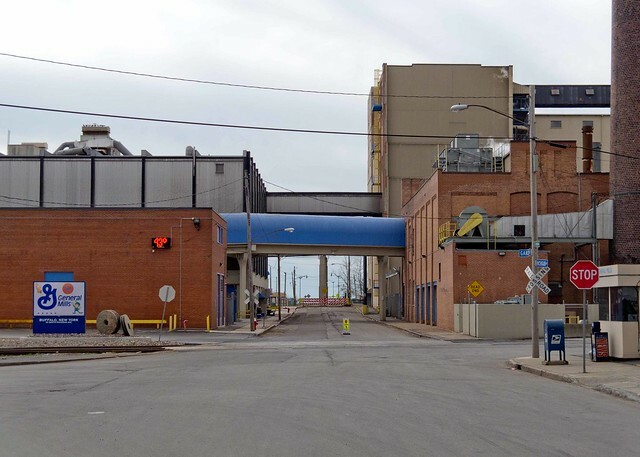 Lackawanna Mayor Geoffrey Szymanski will now seek a one week adjournment in the case involving the Bethlehem Steel Administration Building, according to Common Council President Hank Pirowski, who called today. Judge Kenneth Case hears the matter tomorrow morning at 10 am in Erie County Supreme Court. The adjournment will give both sides additional time to agree on the specific language for a longer stay providing Gateway Corporation additional time to explore its alternatives. 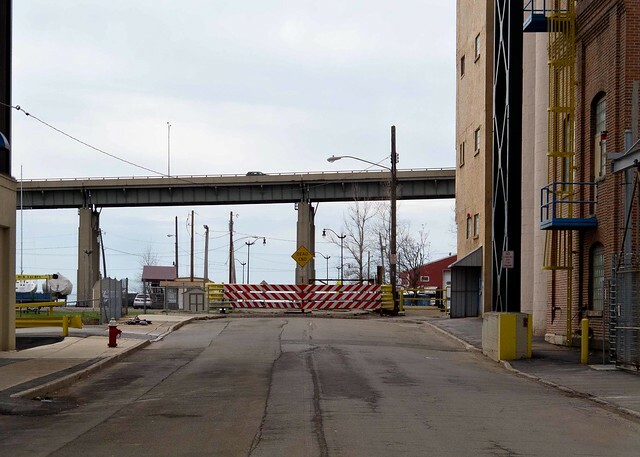 According to Pirowski, the City of Lackawanna is willing to give adaptive reuse a second look. 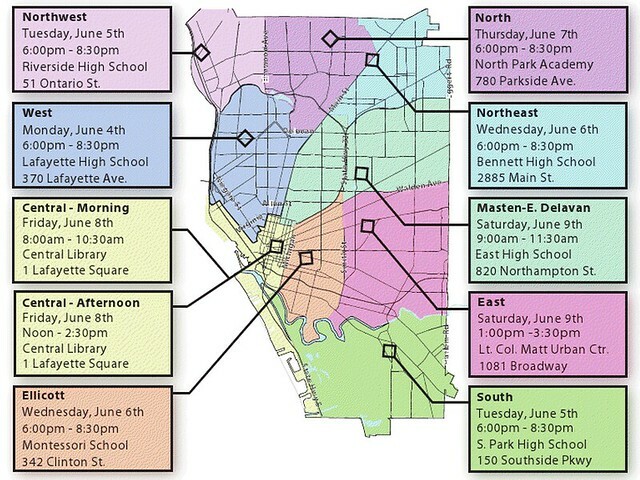 As early as yesterday, the Mayor's position was unwavering: seek immediate demolition. 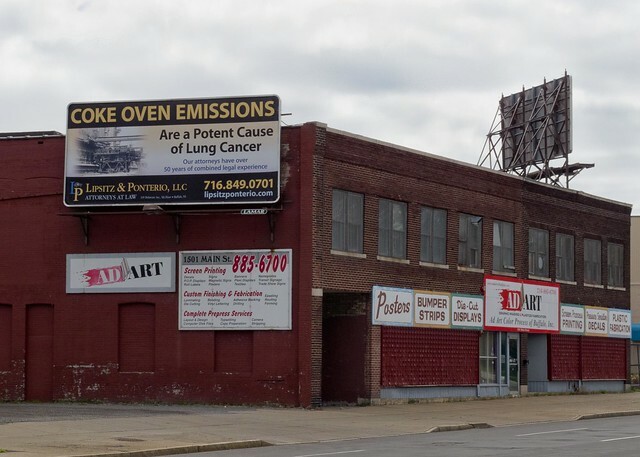 The Lackawanna Industrial Heritage Group has been working closely with attorney William Magavern, preservation consultant Jason Yots, and the building's owner to find alternatives to demolition. 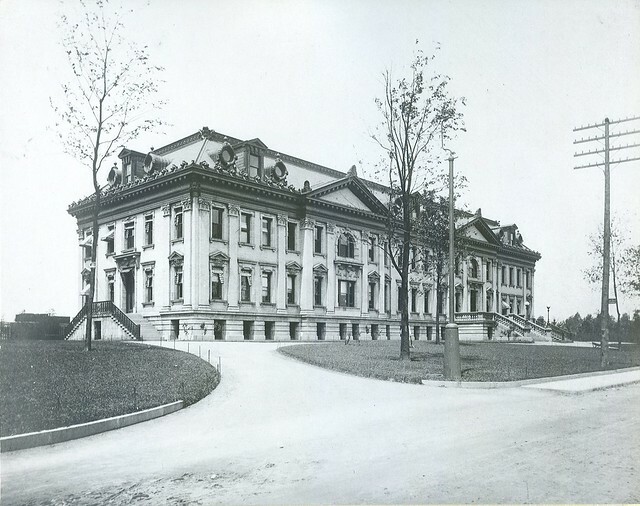 The fate of the Bethlehem Steel Administration Building was to be decided on Wednseday morning in Judge Case's court. There's hope for Old North. Letters of support from Preservation Buffalo Niagara and William Magavern were sent to Judge Case. 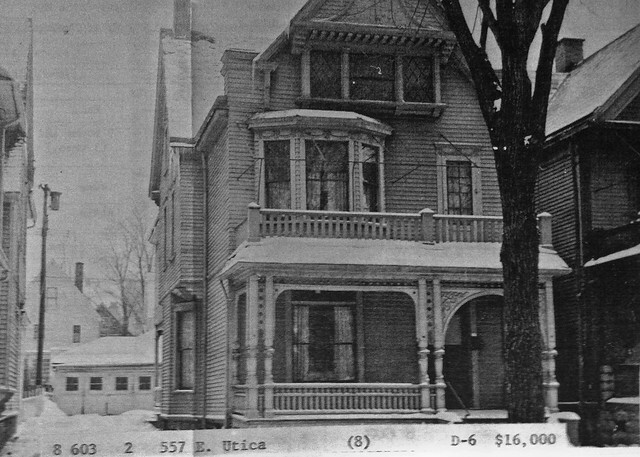 Local preservationist, artist and house historian Dana Saylor recently found this picture of 557 East Utica. It's from the mid 1950's and depicts a gorgeous City residence. 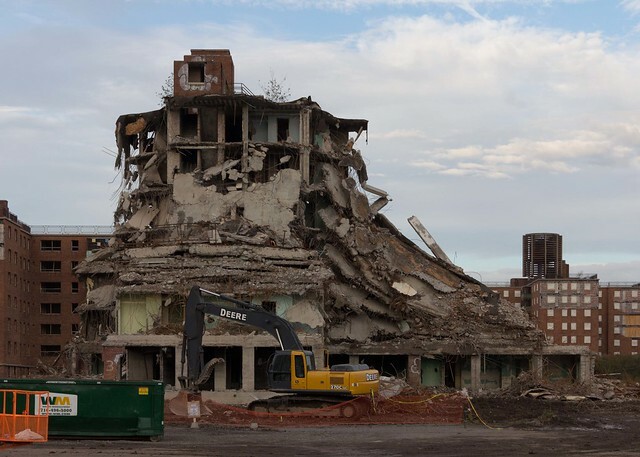 The negotiated 30 day demolition stay with City officials expires next Friday. 557 East Utica has one week left before it's trucked to a landfill. Please take a moment to circulate this post about 557 East Utica to individuals and groups in your networks. 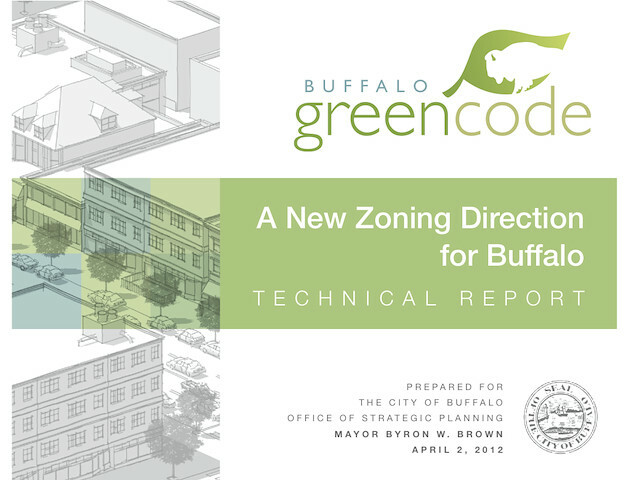 There's a Buffalo Rising post and comment stream that appeared shortly after the announcement was made to halt the demolition. 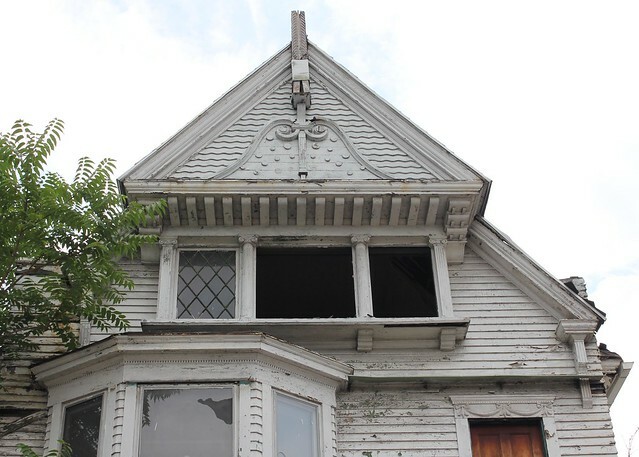 Two other local preservationist bloggers picked up the story. Kevin posted at Unbreakmyhouse and Mike Puma posted at Views of Buffalo. Please email me if you're interested in purchasing the house and presenting a qualified purchase offer. Terry Robinson - Preservation Buffalo Niagara Board member - lives around the corner and has agreed to help a prospective buyer better understand the neighborhood. You can reach Terry via email. Darren Cotten graduated with a Masters in Urban Planning last week from the University at Buffalo. 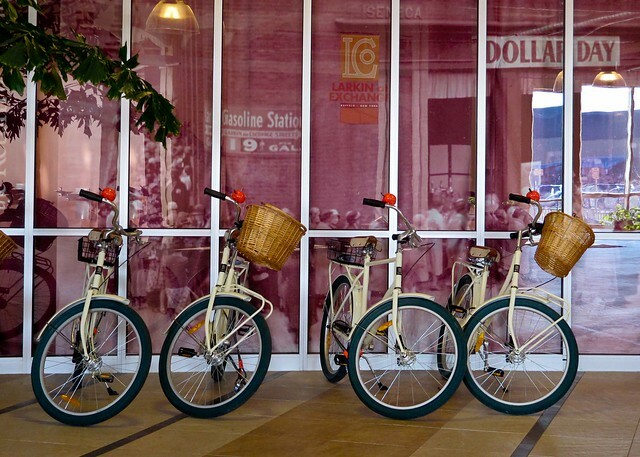 He sent me his thesis project earlier today: Heritage Tourism: In a Post-Industrial City (PDF). 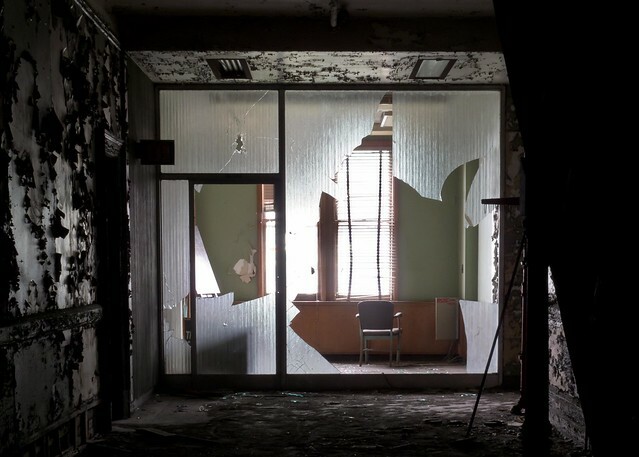 Darren's work speaks directly to the potential reuse of the Bethlehem Steel North Office building. Take a few moments to download, read and learn more about the value of this truly unique building that may be days away from the landfill. 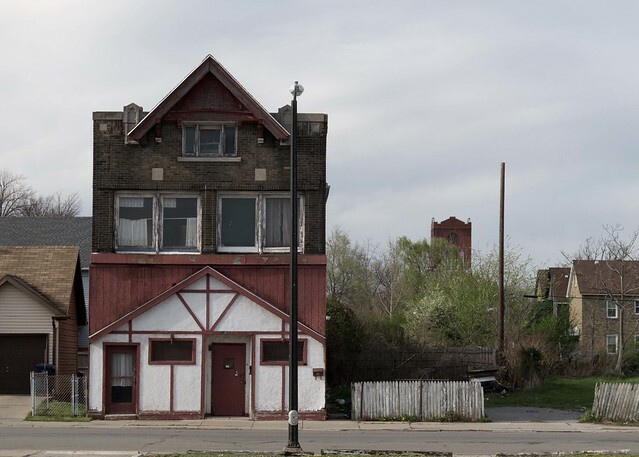 I've been working with Darren for the past few months on the City's near East Side. 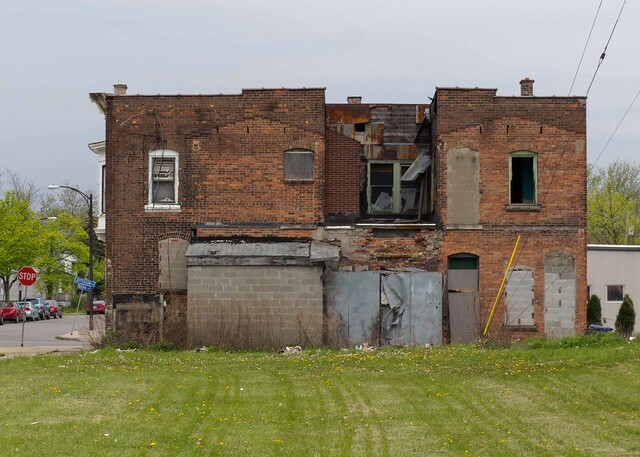 He's filed a Homesteading application with the City's Division of Real Estate and intends to make a City-owned residential property, one that was slated for demolition last November, his home. Darren is also the founder of the University Heights Tool Library. 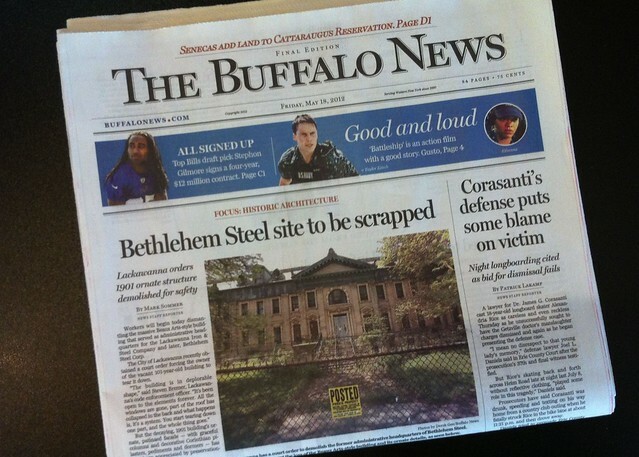 See today's Buffalo News front page article - Bethlehem Steel site to be scrapped. 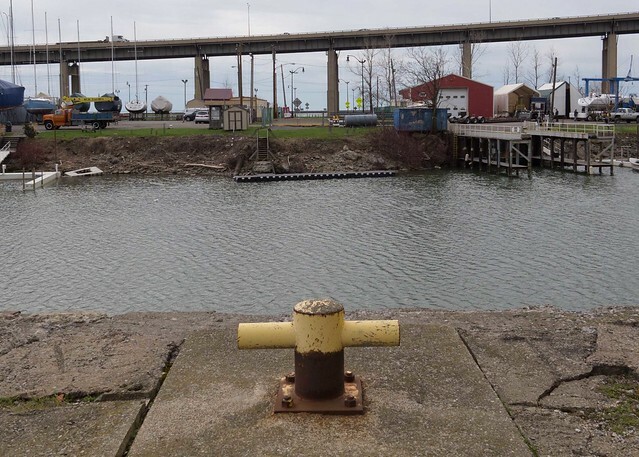 Please take a moment to read and sign Preservation Buffalo Niagara's online petition. On Wednesday evening I met George Richert from WIVB and Steve Bremer, the City of Lackawanna's Code Enforcement Officer on site. Here's that story and video clip. 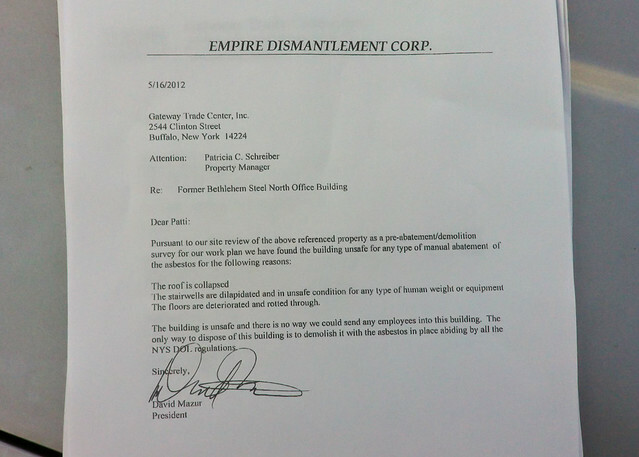 Steve handed me a press packet containing numerous items including this email he'd received earlier in the day from Elizabeth Martin, NYS Division of Historic Preservation. The following is from Steve Bremer's press kit. 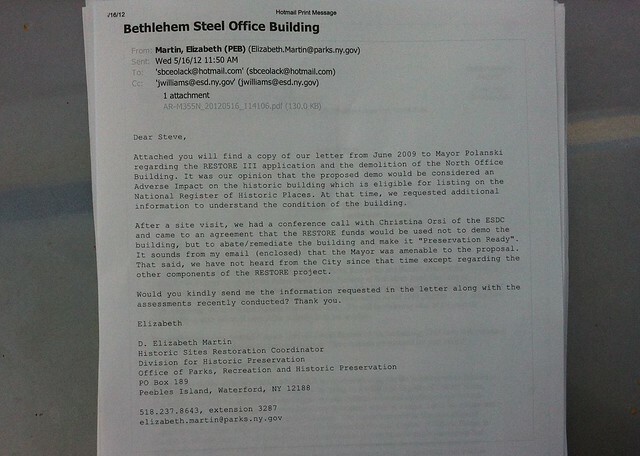 Money was clearly available in 2009 to make the Bethlehem Steel North Office Building "preservation ready". 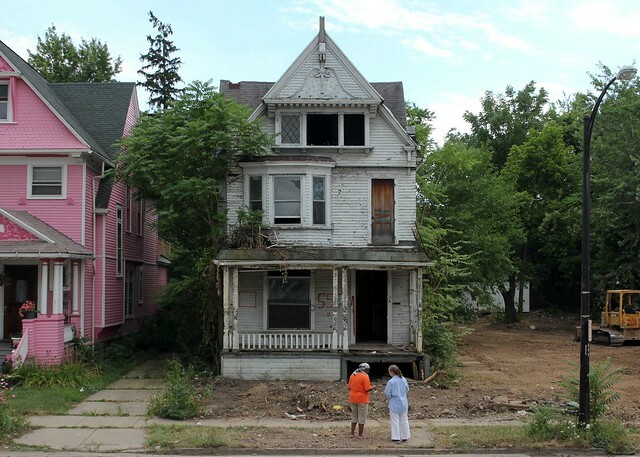 The former Mayor of Lackawanna was thought to be cooperating in using RESTORE NY funds for this purpose. Why wasn't this pursued? 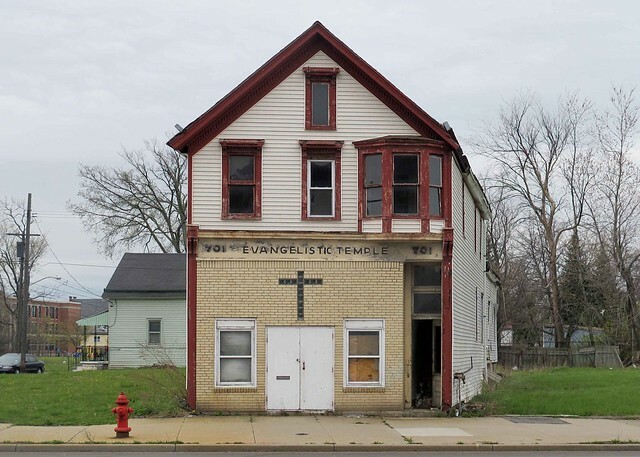 Why was the building really condemned and court ordered to be demolished? The photographic and eye-witness evidence is completely different from the official line - "it's too far gone to save". Photographers who've been visiting the historic Bethlehem Steel headquarters building for years have formed this FaceBook group. 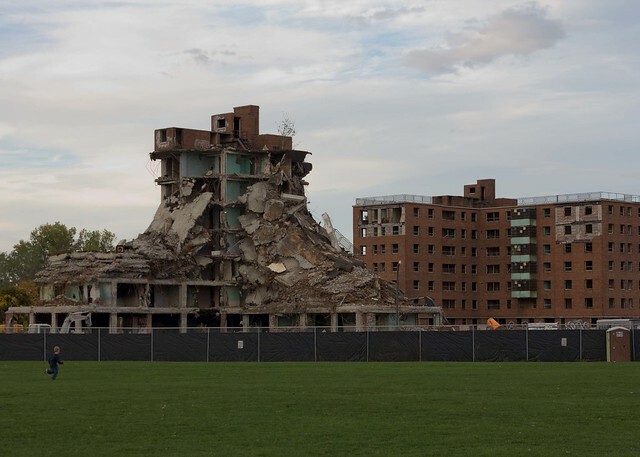 The photographic evidence suggests a structurally sound building and not one of impending implosion or collapse. On Sunday afternoon all the floors were safe - a few holes on the first floor, second and third that corresponded with a roof leak. The central staircase had collapsed. There are two other stair cases that provide access to the entire building. There was no roof collapse. 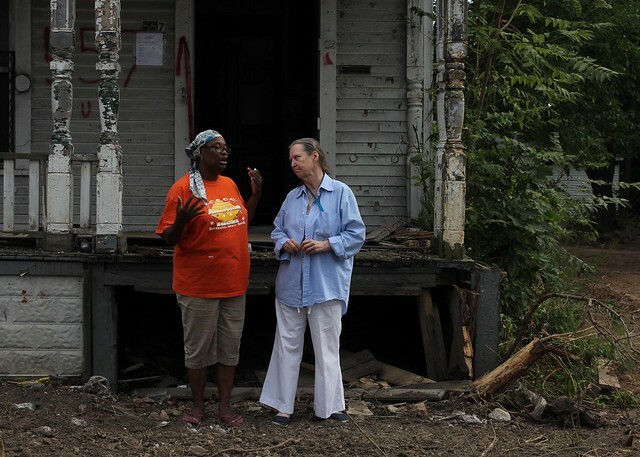 Why would a City Code Enforcement Officer and a demolition company misrepresent the actual conditions?